In 4-H Club, students' task was to build a flashlight only using a battery, foil, and a lightbulb. During their building, the students and the 4-H representative talked about electricity and how you have a conductor, electrons, protons, and neutrons. They were successful in building their flashlight. CMS Track earned 3rd Place in Stallion Invitational meet. Girls group at CMS. Miss Shenika Bonds (far right) is a health educator at health department. From: Brigitte Passman, 4-H Youth Development Agent, Tipton County: Today the 4-H students completed a STEM project where they had to design a space shuttle to safely land without their alien marshmallow falling out. 4-H students were not allowed to place anything directly on top of their cup and only had a limited use of resources to complete the activity. 4-H students learned life skills of working together, critical thinking, problem solving, and wise use of resources. Ms. Linda Carmack's Art Club Students. See their art at the club and organization page under Student menu at the top. At the January 4-H Club meeting students made dog play toys for the local animal shelter and have included their picture to this email. The sports award banquet for players from late fall to spring will be held on May 7th at 6:00pm. 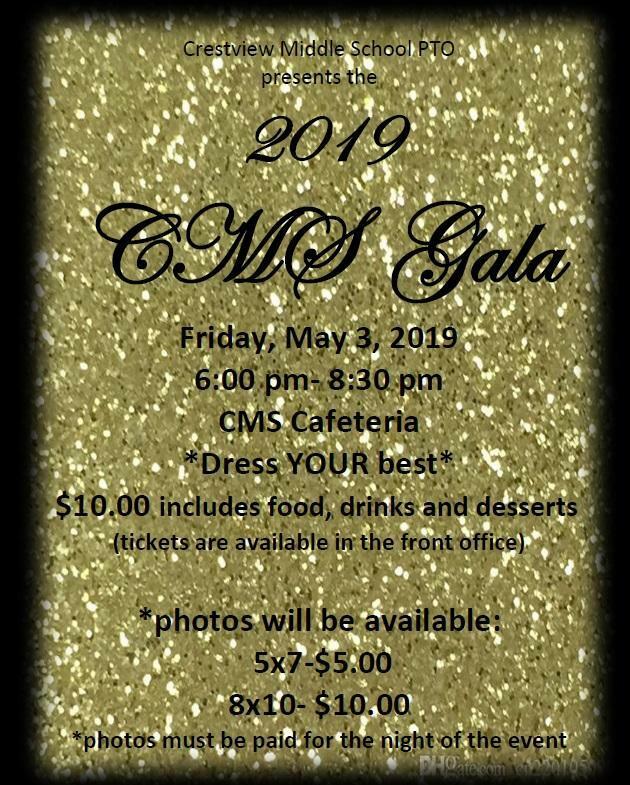 The following sports players are expected to come and receive awards that night: Cheerleaders, Boys and Girls Soccer, Boys and Girls Track, the Tennis Team, and Girls and Boys Basketball team. Players will eat free that night. All parents and family members are charged $10 each and must buy tickets in the school office by Thursday, May 2nd. | For 2019-2020, Boys basketball tryouts for current 6th and 7th graders are Wed. May 15 and Thursday May 16 3:30-5:30. A physical must be on file before you can try out. | Girls basketball tryouts for current 6th and 7th grade students are April 30th, 2019 at 3:30pm to 5:00pm. | Cheerleading tryout clinic dates are April 29th, 30th, May 1st, and May 2nd from 3:30pm to 5:00pm | The 2019 CMS Gala has been announced. May 3rd. All CMS students invited. Dress your best. Tickets $10.00 and can be purchased in the front office. Photobooth will be present. Prints must be pre-ordered. | TNReady Testing Begins with Algebra 1 on Monday. Math and Social Studies will also be this week. | YEARBOOKS are in process of being printed. We still have a few left for purchase. $40 is the current price. May 1, price goes up to $50 (cash only). Reserve your yearbook now and don't get left out. Print the form at the bottom of the Buy Your Yearbook page (link located at bottom left) and bring payment ($40) to Mr. Mooney to get your book reserved. | Crestview Middle School's Weathernet is down due to recent high wind in the past few days. Our instruments were blown off the side of the building on to the ground. The company has been notified and will update you with anything that comes from the company. | All 8th grade caregivers, please print a copy of the form in the article titled "8th Grade Promotion Letter to Caregivers" concerning your child walking at promotion ceremony in May. | YEARBOOKS are still for sale. They are $40 now until April 30th. Accepting in-person orders only. Please complete the form found at Buy Your Yearbook logo below. May 1st, prices for yearbook go to $50 (cash only). 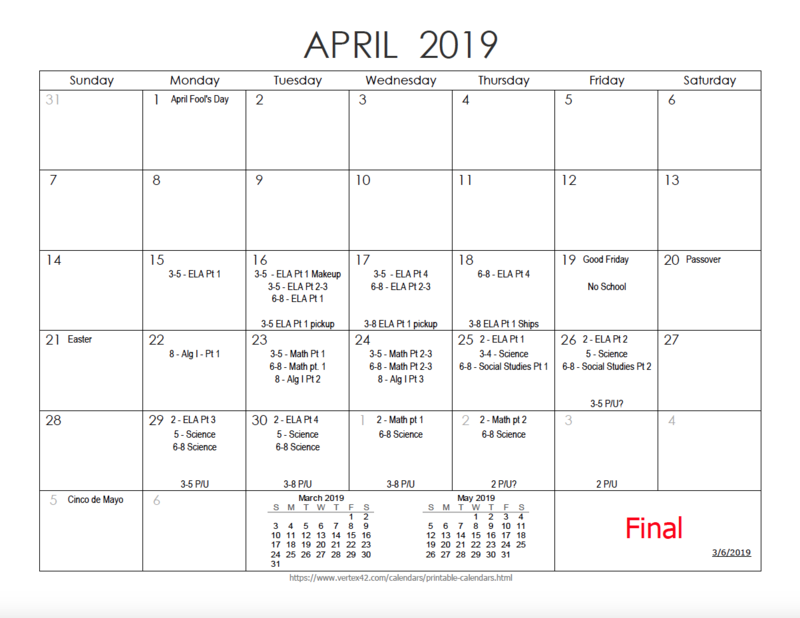 | The TNReady Testing Calendar for 2019 is out on the website, in our Facebook, on Twitter, and went out on Remind 3/26/2019. Be sure you have printed a copy of it from the Latest News section of our site. The PDF is a calendar that shows the subjects to be tested, in what grades, in what order. Please view, print, and post this calendar on your refrigerator. Remember, these tips can help you: 1. GET TO BED EARLY. Turn off the cell phones at night. 2. EAT A WELL BALANCED BREAKFAST on the day of the test. 3. PARENTS, plan around the test. Make appointments after school for your children. 4. LISTEN TO INSTRUCTIONS GIVEN BY TEST ADMINISTRATOR. 5. READ ALL DIRECTIONS ON THE TEST WHEN THE ADMINISTRATOR GIVES YOU THE CUE TO START. 6. READ EVERYTHING CAREFULLY. Some questions may say select more than one answer. 7. TELL YOURSELF YOU CAN DO IT! ROCK THE TEST! 8. WATCH YOUR TIME CAREFULLY. MAKE THE BEST ANSWER CHOICE IF YOU ARE NOT SURE.